I’ve given up writing my full length posts for my Christmas book haul which, I show below, was rather fine.This is in part a result of the type of books one gets for Christmas, and in part the conditions under which they are read – in a Christmas cake induced haze, for my part. 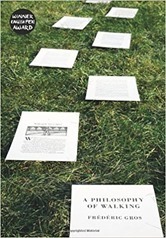 A Philosopy of Walking by Frédéric Gros was, like the best presents, something I wouldn’t have got for myself but nevertheless enjoyed. The book interleaves chapters on various walking related thoughts with some walking oriented biographical content. This covers Nietzsche, Rimbaud, Rousseau, Nerval, Kant and Ghandi. The predominant feeling from these biographies is a bit grim, several of the protagonists died young or after prolonged illness – Nerval committed suicide. Their walking in feels compulsive. Ghandi lived to a ripe old age but was ultimately assassinated. Kant took the same walk every day, he lived to 80 but it sounds pretty dull! The chapter on pilgrimage struck a cord with me, I’ve been meditating for a while which often involves focusing on a mantra or physical manifestation, like breathing. Some pilgrims take a similar approach combining walking with a prayer-like mantra. Somehow the author has missed our family favourite walking habit – humming the Imperial March from Star Wars as a rhythm to walk to along broad well-made paths in the Lake District. The book is translated from French, I learned this on reading in a footnote that the French word témoin which I knew meant “witness” also refers to the baton in a relay race. 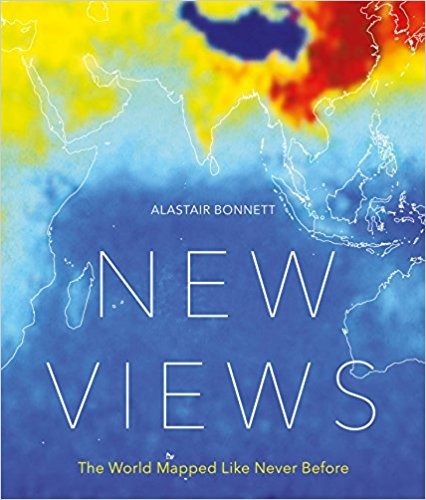 New Views by Alastair Bonnett is a different manner of Christmas book, a coffee table book – as are the rest of the books in this post. New Views is a collection of world maps illustrating different data in three broad areas which could be described as physical, human and animal, and trade. The pattern is the same in each case – a double page contains a map with key, and on the following double page is some text describing the context of the map and another, different graphic. The maps are very much on the global scale, cities may be mentioned here and there but the overwhelming impression is of the world as a whole, not individual countries. I liked the map of lightning strikes which highlights odd areas, particularly in the east of the Democratic Republic of Congo which has the highest rate of lightning strikes in the world. The maps of amphibian and bird diversity are fun too – they map out features of the underlying geography like rivers and mountains but in different ways. I was surprised to learn just how big an exporter of nuts the US was, I should have known this since I constant in my last job was the monthly scrape of the reports of the almond board of California for a customer. Also I learned that Brazil exports no Brazil nuts because they don’t grow there! 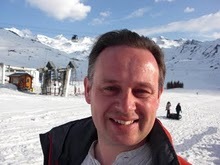 Sometimes the colour keys are a bit cryptic, that’s to say I couldn’t distinguish between two categories on the scale. On another map countries where there is no data are omitted completely which makes the map difficult to parse unless you have a photographic recall of the shapes of the countries of the world. I was puzzle to learn that the viper was the only poisonous snake in the United Kingdom – I always called them “adders”. This is a creditable work of this genre. 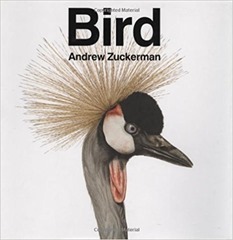 Bird by Andrew Zuckerman is an immense book, comprised entirely of photographs of birds shown against a pure white background. There are a few words, and a pictorial index which names the birds, at the back but the main body of the text is completely wordless. The pictures are gorgeous but I found myself wanting more having flicked through to the end of the book. The style is intentional and is contrasted with that of Audubon who included much more context in his famous paintings of birds. Technically the photographs are very good to excellent. Zuckerman has produced a number of books in this style, I’m most interested to see his works on flowers and creatures. 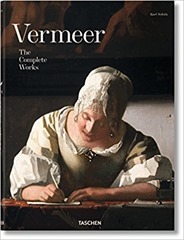 Vermeer: The Complete Works by Karl Schütz. I was surprised to read that there are only 35 works attributed to Vermeer. This may be because he fell out of popularity after his death in the 17th century and interest was not revived until the 19th century. 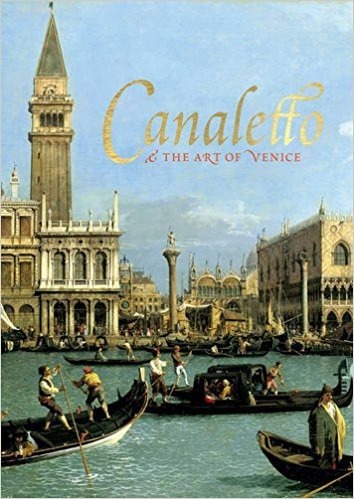 Canaletto & the art of Venice by Rosie Razzall and Lucy Whitaker. The authors names are very discreetly displayed on this volume. 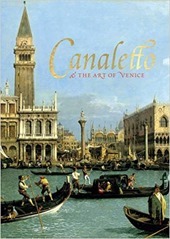 I’m a fan of Canaletto – I love the almost CAD-like precision of his architectural paintings.